Posted on November 26, 2018. Filed under Association News. Be the first to comment. 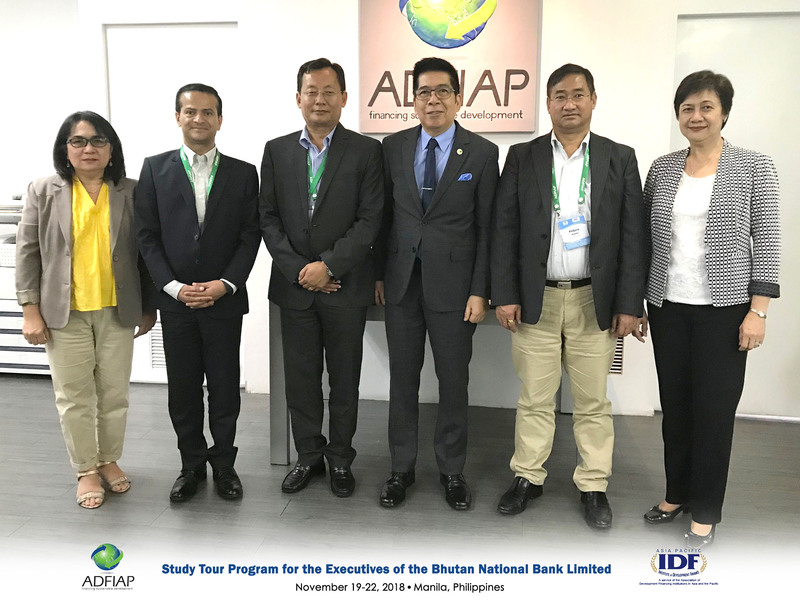 On the request of the Bhutan National Bank Limited (BNB), an ADFIAP member, the Association’s Asia-Pacific Institute of Development Finance (IDF) organized a 4-day study tour program (STP) on SME financing & development for three BNB officers from November 19-22, 2018, in Manila, Philippines. The objective of the STP was to familiarize the participants on the various facets of SME financing and development in the country through classroom lectures, institutional and project visitations, and onsite observation to learn firsthand the SME environment in the Philippines. 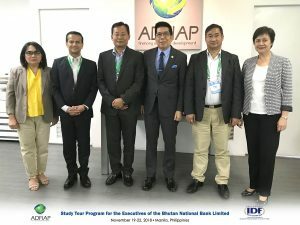 The institutions visited were the Philippine Bureau of Small & Medium Enterprise Development/Department of Trade and Industry (BSMED/DT), the Central Bank of the Philippines, the Development Bank of the Philippines (DBP), the Small Business Guarantee Finance Corporation (SBGFC), the Small Business Corporation (SBC),and RCBC Savings Bank (RSB). During these visits, the participants were able to gain insights of the country’s SME sector, government policies as well as the SME “Go-Business Program” of the government; regulatory role on the promotion and development of the SMEs; SME lending initiatives; risk-based lending, and commercial lending programs for SMEs. The DBP-supported SME project visited by the group was the First Snowden Systems and Industrial Corp., an all-Filipino company with 20 years experience in providing clean air solutions to engineering applications and offering complementary industrial solutions covering mechanical, electrical, civil and architectural works. The speakers who shared their insights during the lectures included: Ms. Alice M. Opena, Bureau of Small & Medium Enterprise Dev/DTI (BSMED), Department of Trade & Industry (DTI); Mr. Mynard Bryan Mojica, Bank Officer 1V, and Mr. Cesar Augusto Villanueva, Bank Officer IV, Central Bank of the Philippines (BSP); Mr. Rallen O. Verdadero, Manager, Head PDM II, Mr. Paul D. Lazaro, First Vice President, Mr. Dan Gonzales, Head, SME-NCR, Development Bank of the Philippines (DBP); Mr. Rajan Ashok Uttamchandani, Chairman & CEO, Esquire Financing, Inc.; Mr. Ian Briones, First Senior Vice President of the Philippine Export-Import Agency (PhilExim); Ms. Joji Flores, Head, Capacity Building Program, Small Business Corporation (SBC); and Mr. Elmer M. Aguino, Head, Wholesale Lending Division, Mr. Guilberto K. Benedicto, Division Head, Product Development & Channel Management, and Mr. Vince Berden Head, Retail Banking Group, RCBC Savings Bank (RSB). The SME Study Tour Program (STP) is one of the STPs that the IDF, the career development center of ADFIAP, has been offering. For more information on STPs, please email inquiries@adfiap.org.